Did I enjoy it? YEAH! 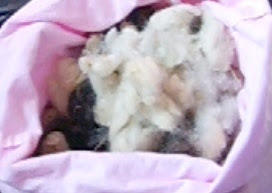 Turn a handle and raw fleece becomes sliver. Well, there's a bit more to it than that. You're supposed to tease out your locks and separate the tips. I like to use a pet comb rather than a flick carder, and found it difficult not to do too much. I had to keep reminding myself that the drum carder was going to do the hard work for me. You have to take the fibre off the drum, split it lengthways and put each half through again, and then repeat if necessary. I did find that the more preparation you do, the better the finished result is, and that a bit more work with the comb saves one pass through the drum carder. Finally you take the fibre off the drum, roll it lengthways and stretch it out to make sliver. Is it cheating to make it this much easier? 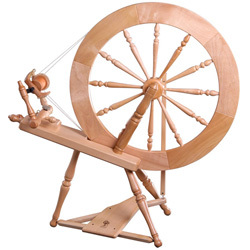 I don't know, but I guess no more so than using a spinning wheel. I don't know when I'll get around to spinning it lol! The fleece I've somehow accumulated takes up so much space though, and it uses a bit less once it's converted to slivers. It looks nicer too as little nests, I think. Sculptrix - I now have feltable wool in quite a range of colours. Maybe when you're here in a week or two we can have a felting session? !